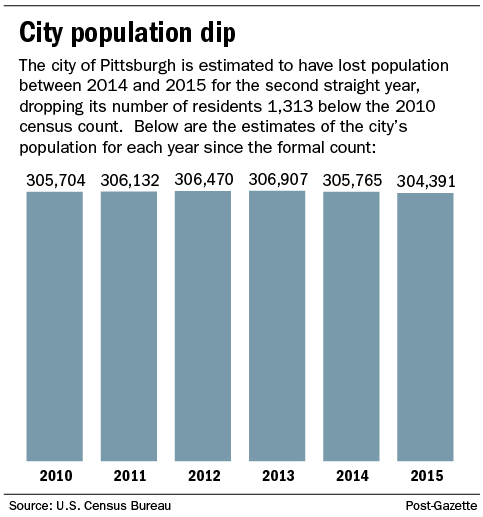 ICYMI, population estimates just out for the city of Pittsburgh show a decline between 2014 and 2015 of 1,374*. If true it represents the biggest annual population loss in almost a decade (since between 2006 and 2007 to be precise). I think Edward Tufte might take issue with the PG's accompanying illustration of the data, so here are a couple other breakdowns of the number. First is just an update of graphic I have put up in the past showing the evolution of the time series of Census estimates for the city over time. So basically a recent peak in the middle of 2013. If you are curious what showed a more rapid jump in the city's population earlier this decade, I have gone into that in the past in more detail here, but the short version was there were some errors in reporting of the population of a single dormitory-like residence with a large number of college students. But it was just an error, though it was quite a headline at the time when the city's population trend first showed a positive number. Turned out, coincidentially, or luckily, to be true in the following years, but it was not true at the time. Going back even earlier, net annual losses in that 3-4K range were pretty typical going back a frightfully long time, but from around 2004 to 2013 you see a solid trend moving positive. Hard to continue it though and for now a qualitative break to the downside over the last 2-3 years. True, a lot of caveats with this particular data, so we will see going forward. *PG article current says the annual loss is 1,313, but my subtraction shows the loss is 1,374?? If you were to plot households for the same period, I expect you will see growth. The average household size will have declined and the number of dwelling units increased. Vacancy rates may vary, but total stock will be up. There won't be a building permit match for new units, as many are apartments within a previously existing unit. The daytime population of the city is more important. It may be double the Census count. I'm not sure if there's a good methodology for calculating that. It's needed to stop making cities look like failures.